WBMDFC Notification is out. WBMDFC is recruiting for 41 Various Post Govt Job Posts. You can check WBMDFC - West Bengal Minority Development and Finance Corporation last date, download WBMDFC notification, visit WBMDFC official website and check other WBMDFC Vacancy details.Complete Vacancy and recruitment Details about 41 Various Post Govt Job vacancies in WBMDFC are provided below by JobSarkari.Com only for you. Last Date of Apply Online. 17/02/2019. SC/ST/BC of Other State Candidate. No Exemption of Fee. Mode of Payment. Candidate Need to Pay Application Fee Through Online Payment Gateway System. Assistant Manager. Candidate Must Have Passed Degree in Any Discipline With 5 Years Experience in Related Field And Having Knowledge of Accounts And Accounting Procedure With Diploma in Computer Application. Min 26 And 37 Years. 22. Lower Division Clerk. Candidate Must Have Passed Class 10th And Having Basic Knowledge of Computer And 5 Years Experience in Related Field. Min 18 And Max 40 Years. 13. Group D. Candidate Must Have Passed Class 8th. Min 18 And Max 40 Years. 05. Driver. Candidate Must Have Passed Class 8th. Min 24 And 45 Years. 01. 2. Click on the Apply Online Link Given in Important Link Section. 3. Fill All the Mandatory Details in the Application Form. 4. Upload the Scanned Copy of Required Documents in the Prescribed Size and Format. 6. Online Application Can be Submitted on or Before 17th February 2019. Q. 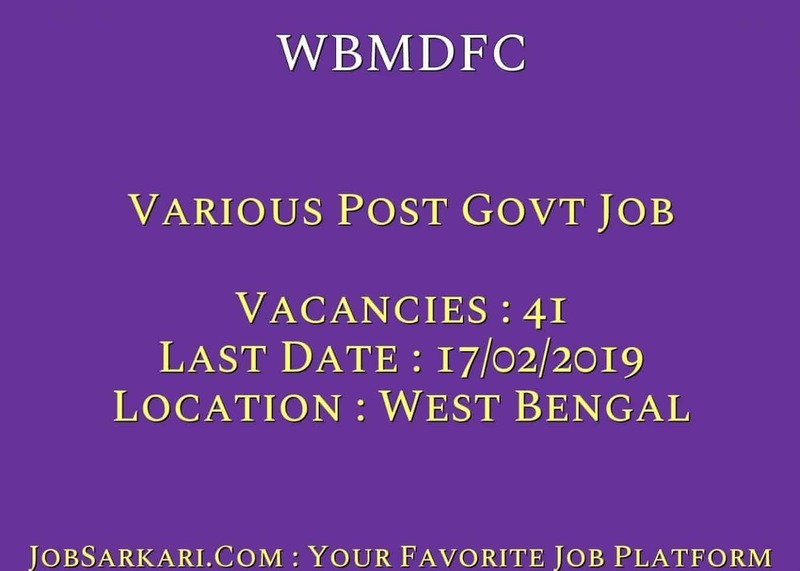 What is the Last Date For WBMDFC Various Post Govt Job Vacancy ? A. 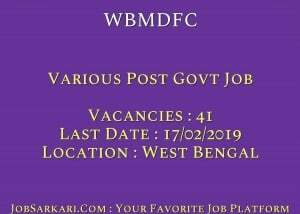 Last Date for WBMDFC Various Post Govt Job Posts is 17/02/2019. Q. What is the Form Type of WBMDFC Various Post Govt Job Recruitment ? A. The Form Type for WBMDFC Various Post Govt Job Posts is Online. Q. How many vacancies are available in West Bengal Minority Development and Finance Corporation Various Post Govt Job Posts ? A. There are about 41 Vacancies in West Bengal Minority Development and Finance Corporation Various Post Govt Job Posts. Q. What is the Full Form of WBMDFC ? A. Full Form of WBMDFC is West Bengal Minority Development and Finance Corporation .